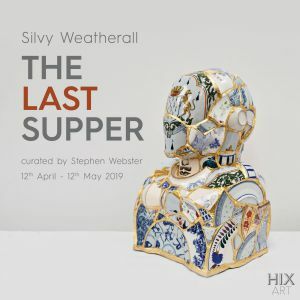 HIX ART is pleased to present The Last Supper, an exhibition of new works by multi-disciplinary artist Silvy Weatherall, curated by contemporary jeweller, craftsman and art collector Stephen Webster. Weatherall is preoccupied with objects that have seemingly ceased to function, rendered obsolete for whatever their original intended purpose by their age or physical state; Weatherall sees the potential where others do not. Interested in the history of an object, she questions functionality and attachment. This collection of ceramics is a sculptural interpretation of Leonardo Da Vinci’s iconic painting The Last Supper, depicting Jesus and his 12 disciples. The thirteen life-size busts are constructed from broken china that the artist has collected herself or been given over the years. Though there are no defining features or characteristics on the figures, some of the busts have shapely allusions to familiar features; eyes, noses and ears, where the ceramics provide a nod to recognisable form. After heavy rain flooded Weatherall’s studio, the artist found herself revisiting her collection of broken ceramics. This sculptural series and exhibition’s title is a play on words, evolved from a speculation into what was the ‘last supper’ served upon these now obsolete china plates and bowls? Weatherall challenges the throw-away nature of our consumer society by giving new life to other people’s discarded and unwanted possessions. The figures vary in character by virtue of their china, size and shape, but all feature the similar, simplified sculptural form of a head, chest and shoulders, inspired by the shape of phrenology busts that were popular in 19th century psychiatry. 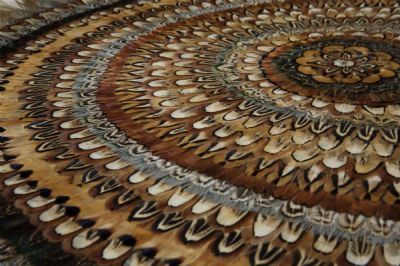 The artist aims to create objects of desire that resonate with people through identifying, questioning and remembering an object’s history, and the different people who have interacted with them. The artist has employed the ancient Japanese art of Kintsugi (‘to repair with gold’). Embracing the aesthetics and ethos of wabi-sabi (a Japanese cultural view centered on the acceptance of transience and imperfection), Kintsugi rejoices in an object’s cracks and imperfections, not only are they the very thing that makes it unique, they also show that the object has had a life, a journey, and a story to tell. Another facet to a ‘last supper’ is alluded to through the additional placement of one of Stephen Webster’s finely crafted knives. Webster’s intricate and detailed piece has been cast in gold as a nod to this ancient technique and to form a bridge between art and craft. Exhibited alongside these broken pieces of dinnerware, the knife adds an intense energy and a threatening element to symbolise the underlining betrayal of Judas who dined at the Last Supper. Displayed alongside the ceramics are a series of works on paper which the artist sees as an extension to the sculptures. The artist has produced portraits of the individual busts, investigating the cracks on their surfaces and the negative spaces in between them. The works question how we are defined and shaped by our experiences and how, in the end, they are the very thing that make us who we are. About HIX ART: HIX ART was established by the restaurateur and author Mark Hix in 2012. It is located in the basement of Tramshed on Rivington Street in Shoreditch, London, and is run by Director Sophie Harriott. It stages up to eight exhibitions annually, and its curatorial programme embraces a wide range of artists, from the established to the undiscovered. Opening Times: For the duration of the exhibition, the gallery will be open Monday to Sunday, 11am – 6pm.